Rappers have always rapped about drugs, primarily because many of them are from areas heavily burdened with the pain of addiction. They spin tales of dope boy lives and climbing to the money mountain top by hustling their intoxicant of choice from this corner or that one. But when you turn down the volume and look at what they are talking about, it’s not glitz. It’s not glamour. As a matter of fact, prior to March 27th 2009, if you lived in New York, it was probably a lengthy jail term without the benefit of treatment or rehabilitation. And you could thank the Rockefeller Drug Laws for that. The laws, enacted under Governor Nelson Rockefeller in 1973, were the strictest of their kind in the country. While the intent was to catch and incarcerate upper level members of drug cartels flooding the streets of New York with their product, the net cast found a host of low level offenders and addicts. Sentencing at the judge’s discretion was also eliminated and replaced with long mandatory sentences with no regard for the offender’s situation or circumstance. By 2008, there were 14,000 drug offenders in New York’s prison system. According to drugpolicy.org, over 90 percent were either black or Latin. As the resentment mounted over a grouping of laws that obviously missed their mark, the hip hop community stepped in. But they weren’t singing the praises of scales and pipes. 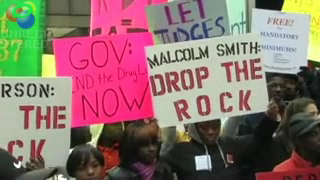 They were taking a stand against laws that unfairly targeted the dude on the corner and the addict he sold to. They were taking a stand against the dissolution of urban families due to the lengthy incarceration of one parent or maybe two. They were taking a stand against the life that forced them to pick up their pen and pad in the first place. In 2003, a group of protestors which included Jay-Z, 50 Cent, Mariah Carey, Dame Dash, Busta Rhymes, Erykah Badu, M1, the Beastie Boys and Fat Joe took their cause to the steps of City Hall in Manhattan. The event was chronicled by filmmakers Michael Skolnik and Rebecca Chaiklin and later released as a documentary entitled Lockdown, U.S.A. Jim Jones recorded a song of the same name for the event. The demonstration attracted over 60,000 people and was the catalyst for a small reform put into place the next year. The changes included a shortening of some offenders sentences and the addition of in-prison drug counseling. But the crux of the argument, the extended mandatory sentencing, was not addressed. “The Hip Hop Community hopes that the new provisions proposed will bring retroactive relief to those unjustly incarcerated in the state prison system. This is an important step forward and we must continue to raise our voices until full justice is served to the families and communities disproportionately impacted by these laws during the past three decades,” said Hip Hop Summit Action Network President Dr. Benjamin Chavis via an HSAN press release after the revisions were signed into law. Dr. Chavis’ sentiment is supported by a large coalition of activists, including the Drug Policy Alliance and Mothers of the NY Disappeared. Last week, their persistence was rewarded. A deal brokered last Friday by the governor and state congressional leaders will put the ability to sentence back in the hands of New York’s judges. It will also allow for community drug treatment as well as prison rehabilitation. While this is a victory many can claim as theirs, there is no denying that the New York hip hop community is among them. The state would also like to implement expansions in both its community outreach and drug courts. The bill is hefty; about $50 million. But there are those who believe the price is minimal when considering the cost of incarceration and family devastation. There is also consideration for those already in prison due to the now defunct laws. Possible commuting of sentences is on the table, but the details have not been determined according to the New York Times. With this huge victory under his belt, HSAN co-founder Russell Simmons is ready to take his Network to even larger heights, possibly on a national level. So amazingly enough, the people who are chastised for glamorizing the drug culture are the same ones who righted New York’s wrong. The men who weave these stories about back alley sales and all their horrible accoutrements shed the light needed for state lawmakers to see that these rules were not helping, but hurting their communities. These emcees may attract the ire of drug opponents far and wide, but they just made New York a fairer place to live. Who knows? They may have even found a bit of absolution of their own. This entry was posted in News, Special Report and tagged HSAN, Russell Simmons, war on drugs. Bookmark the permalink.